Remember seeing poetry on King County and Sound Transit buses a few years ago? After a brief hiatus, Poetry on Buses coordinated by 4Culture returns this Monday 24 April to the Puget Sound. 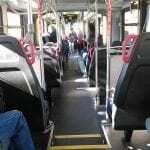 KBCS’s Casey Martin brings us this week’s Unmute the Commute story. For more details about the Poetry on Buses project, including the launch party Monday 24 April at the Moore Theatre, visit poetryonbuses.org.